As exclusion day approaches, Multnomah County offers two chances for youth to get their shots so they can go to class. About 5,000 Multnomah County children do not have up to date vaccinations, so county health officials sent letters to their families Wednesday, Feb. 6, telling them their children would be kept out of school and day care if they don't get current on immunizations. The annual school exclusion day takes on new urgency this year as a measles outbreak that originated in Clark County, Wash., has sickened more than 50 people, most of them children. There also are four measles cases reported in Multnomah County. "Unfortunately, this is a reminder of how quickly infections can spread when people are not vaccinated, and that's especially true in places like classrooms where kids spend a lot of time together," said Multnomah County Deputy Health Officer Dr. Jennifer Vines. "I strongly encourage parents to learn more about measles and the very effective vaccine that can protect their kids." To protect the population against measles, at least 93 to 95 percent of people need to be vaccinated to create so-called herd immunity. Some schools in Multnomah County dip below that average. 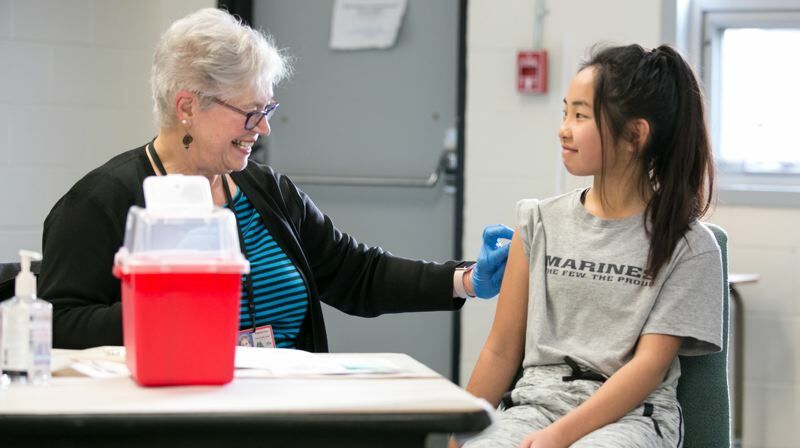 About 91 percent of Portland Public Schools students and 94 percent in Gresham-Barlow and Reynolds school district have been vaccinated. Students must get all their vaccinations, or provide an exemption, by Feb. 20 or they could be barred from public and private schools, preschools and Head Start programs and child care centers. "We want schools and child care facilities to be safe and healthy learning environments, so it is important to get children and students up-to-date as soon as possible," said Virginia Schmitz, community immunization program manager with Multnomah County Communicable Disease Services. Clinics and events are being scheduled where children can get needed immunizations. Families are being told to bring their insurance cards to appointments or clinics for vaccinations. For families who are under-insured or who have no health insurance, Multnomah County offers low- and no-cost immunizations. Student Health Centers in 10 schools will provide immunizations and other primary care for children in kindergarten through 12th grade. Multnomah County's Community Immunization Clinic, 426 S.W. Harvey Milk St., offers many low-cost vaccinations. Call 503-988-3406 for an appointment. In addition, Multnomah County provides low-cost health care at seven primary care clinics, including those who are low-income and uninsured. Multnomah County will also hold two pop-up immunization clinics for children to catch up on their vaccinations before the school exclusion date. Vaccines cost $21.96 per injection, but county officials said nobody would be turned away if they could not pay. The first will be from 10 a.m. to 2 p.m. Saturday, Feb. 16, at David Douglas High School, 1500 S.E. 130th Ave. The second clinic is 9 a.m. to 3 p.m. Saturday, Feb. 20, on the second floor of the East County Health Center, 600 N.E. Eighth St., Gresham.